I took the dogs out early this a.m. to “do their business” and sun was just coming up over my back garden. 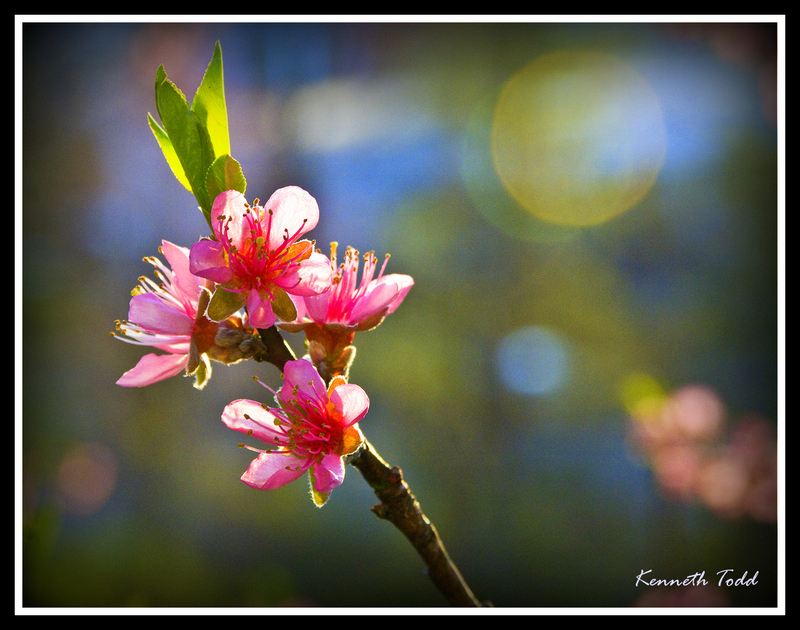 I noticed our peach tree had just started to blossom and made a note to come back and shoot it “another” morning. Went back inside and made myself a coffee and looking out the window at the sunrise, I just said. Why wait? Why not today? I am feeling refreshed, healthy and good. Do it now. Procrastination is a beast. So I went outside and took a couple of shots. Look at this little beauty. I tried a different composition too. I love the blur of the other branches in the background and a little flare from the sun caused a round bubble flare. Almost Bokeh effect like. This is one of my favorites. If I had listened to my procrastinating mind, I would never have enjoyed that moment and added many more good feeling moments as I look at this photograph. So if you are putting off anything today. Don’t! Just do it. If it is doing a chore, starting something, waiting for a “better” moment or perhaps you have your eye on someone and you are too scared to express your interest! Don’t wait, do it now, otherwise you could miss the moment. Don’t let the fear of your mind hold you back. Also remember last 2 days….. I am giving away a FREE iPod shuffle to a random blog reader on March 31 (this is the last day of entering). Why? I have no idea. I am just doing it. It came to me after a recent meditation…:-). I get so many visits, likes and comments from people, which is pretty humbling for me, so I just want to give something back I guess. The best way for me to “control” it, is as follows. Just go “like” my Facebook page (link below), I will then get a random number generator off the internet and then pick the name that corresponds to that number. So good luck. This is just such a lovely photograph–it breathes Spring! Thanks. I am not usually one who loves a lot of flower shots, but I do like this one. I am not going to take credit for this either. As this was mother nature on show.. I love it especially the back lighting such a enthral feeling. Glad you didn’t put it off. It’s lovely and a great way to start the morning. What a beautiful blossom. I’m looking forward to the blossoms here but I think we’re about a month away from that. Lovely…the bokeh!!! Thank you for visiting my blogs! Gorgeous, just looking at that has got me anticipating summer. I’m glad I didn’t wait to look at your post. Truly a beauty!! Carpe Diem is embodied in this shot. Gorgeous! Beautiful shot! I really love the colors in the peach blossom and the orb-like shapes in the background. Very lovely! Such a beautiful blossom! So colorful. I’m liking the two balls of light flare in the upper right, or maybe that’s the bokeh everyone’s talking about. Wonderful colours and composition. Great bokeh also. Did you shoot this one with your iPhone? The bokeh is amazing here! Pablo, No this one was with my DSLR, tripod,filters etc. Very shallow depth of field and the sun flare created that very cool Bokeh.